Sean Feargal Sharkey was born in Derry, Northern Ireland, in 1958. He was the sixth of seven children. In 1976, his final year in high school, Sharkey formed a punk band that was later named The Undertones. In 1978, they released their first single, “Teenage Kicks.” This led to the release of a self-titled album in 1979. The album included the Top 20 UK single, “Jimmy Jimmy”. In 1980, The Undertones released Hypnotized, and had their biggest hits on the UK charts: “My Perfect Cousin” (#9) and “Wednesday Week” (#11). The albums, Positive Touch and Sin Of Pride were released in 1981 and 1983. But after eight years as lead singer for The Undertones, Feargal Sharkey was tiring of the band. At the end of the year he decided to go solo. In 1984, Sharkey released his first single titled “Listen To Your Father”. The collaboration with Madness band member, Cathay Smyth, climbed into the Top 30 on the UK singles chart. A follow up single, “Loving You”, also made the UK Top 30. But in 1985, Feargal Sharkey topped the UK singles charts with “A Good Heart”. The album and the debut single were produced by Dave Stewart of the Eurythmics. “A Good Heart” is a song written by Maria McKee. She was born 1964 in Los Angeles. Her half-brother, Bryan MacLean, was a member of the psychedelic rock band Love. By the early 80’s she was singing with the bands Cowpunk and Lone Justice. Between 1982 and 1986 Lone Justice opened for acts that included U2 and Tom Petty and The Heartbreakers. McKee found out first hand about her heart when she was in a late teenage relationship with Benmont Tench, keyboard player with Tom Petty who was born in 1953. McKee wrote about her relationship in with Tench in “A Good Heart” when she was 19 years old. As a 19-year-old McKee writes “the highest risk of striking out/the risk of getting hurt/and still I have so much to learn.” With her whole adult life ahead of her, Maria McKee was aware that she was just beginning to discover what it was to be in a relationship with another adult. In her relationship with Benmont Tench she was learning about the heart and the durability of love. Other recording artists, including Bette Midler and the Dixie Chicks, have covered songs written my McKee. Maria McKee went on to provide backing vocals for tracks by U2, Counting Crows, Robbie Robertson and Robin Zander. She has also teamed up to record with Steve Earle, Dwight Yoakum and with a number of ex-Talking Heads bandmates. Maria McKee has also collaborated with her husband, Jim Akin, to release a feature film in 2012 titled After the Triumph of Your Birth. She has also published short-story fiction. In “A Good Heart”, the song offers bits of advice. One of these is “anything is better than being alone.” While the lyrics can be seen as contending that it is better to be in the game of love than to be a bystander, there are numbers of situations where it is better to be alone than with someone who is abusive, or in a loveless, soul-destroying relationship. It seems the writer also knows that real love is not easy to come by and a good heart is hard to find. True love that lasts is elusive and, by inference, there are a lot of hearts that are second-rate and inferior. The song is written from the perspective of someone who admits they are new to relationships and they bring high expectations. They have a sense that they have a lot to learn about love and relationships. But, even sensing that, one cannot know what their assumptions and blind spots are about love and relationships without diving in and trying to find love, even at the risk of getting hurt. 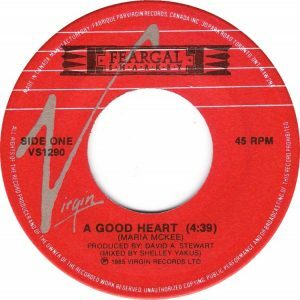 “A Good Heart” went to #1 in the UK, Ireland, Belgium and Australia. In North America, the song had its best chart runs at #3 in Ottawa, #4 in Toronto, #6 in Lloydminster, Alberta, and Vancouver, BC, #7 in both Moose Jaw and Regina, Saskatchewan, and #9 in Boston. 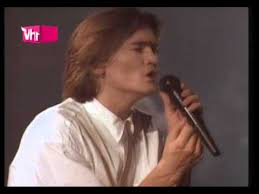 Feargal Sharkey had another Top 10 hit in the Uk titled “You Little Thief.” The song was written by Benmont Tench as a reply song to “A Good Heart”. In “You Little Thief”, we discover someone described as a dream, a girl, a savage, a nightmare, a whore and a thief by taking away “everything I had to believe in.” Now that the relationship is over, the guy is left with nothing, except being broken. “You Little Thief” ends with these words: “there’s no hard feelings/cos when I needed you/you watched me fall.” Given the damning reply song in “You Little Thief”, it might be that “A Good Heart” is self-referential, that the songwriter is not sure if they have a good heart themselves. After the release of “You Little Thief,” Feargal Sharkey went on a world tour. During the tour his mother and sister, while visiting friends in Londonderry, Northern Ireland, were taken hostage by terrorists. They were released later without harm. Sharkey went to America to work on further recordings in Nashville, New Orleans and Los Angeles. Several subsequent album releases in the late ’80’s and early ’90’s were not big sellers. In 1993, he worked with Sinead O Connor and Peter Gabriel for the charity, Peace Together, and the trio recorded the charity single “Be Still”. Peace Together raised funds to support cross-community activities for young people in Northern-Ireland. In 2004, Feargal Sharkey became the Chairman of the Live Music Forum, a UK government task force created to promote live music and monitor the introduction of the new music Licensing Act. He received several honorary doctorates in the late 2000’s. Obituary: Bryan MacLean, The Independent, January 1, 1999. Richard Harland Smith, This, The Mystery: After The Triumph Of Your Birth (2012), Movie Morlocks.com, September 13, 2012. 56. Feargal Sharkey, The Guardian, July 13, 2009.